Enjoy a GETAWAY to this beautifull Cabin with Sauna, in the Mountains! Near Helen, Ga.
Mountainside Falls is located about a 5 Mile drive from downtown HELEN GA! This cabin is a custom built home specifically made for our program. It was designed with every detail in mind and is very well maintained. Built into this cabin’s 3 stories, are a master bedroom with master bath, living room and kitchen, upstairs bedroom with 2nd full bathroom, and downstairs bedroom, (with a 3rd full bathroom), game room with sleeper sofa and a built-in SAUNA. You will ENJOY the kitchen due to the bar and open design of the main floor. After dinner, take a walk downstairs and join the kids in the game room where you’ll find a pool table, TV, queen bed, and the cedar sauna. Or you could spend your evenings watching the sunset rocking in a chair on the complete wrap around deck. 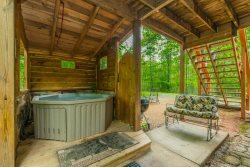 Whether you use the Sauna, Indoor Jacuzzi Tub, Hot Tub on Back porch, play a game of pool or just sit in front of the wood fireplace, you are sure to have the time of your life at this AMAZING cabin. Dist from Office: 10 min. Dist from trout pond: 12 min. The road to this cabin is gravel. Fire Wood Available for Delivery for $24/ 3 bundles. Ask the Office!